Fourth-year Lucy Tang prepares to serve. The No. 16 Maroons traveled to Altamonte Springs, Florida on Thursday in preparation for the three-day-long UAA Championships. With many of their hopes for qualifying for the NCAA tournament riding on a much-needed strong performance, the South Siders opened the weekend with a close 5–4 win in Friday’s quarterfinal contest against Case Western Reserve. With the victory, UChicago improved to 10–4 on the season, dropping the No. 20 Spartans to 12–5. In the eight-team conference tournament, UChicago entered as the No. 4 seed with the Spartans following at No. 5. It was a reversal of a result two weeks ago, when the two teams faced off indoors in Chicago, with the Spartans coming out on top, winning the deciding No. 6 singles match. This time around, the match once again arrived with the two teams holding four points apiece, heading into the No. 6 position. First-year Kat Stevanovich dueled with her opponent, winning the first set 7–5, before Case Western’s Sara Zargham evened up the match. However, Stevanovich confidently won the game, set, and match with a 6–1 result in the third set. With their Friday win, the Maroons advanced to the semifinals to play top-seeded Emory. Unable to capitalize on their momentum, the Maroons produced only one point, and the Eagles proved to be the better team with a dominant 8–1 win. UChicago dropped to 10–5, and Emory improved to a conference best 22–4 record. The only Chicago win came at No. 1 doubles when fourth-year Stephanie Lee and third-year Tiffany Chen triumphed by an 8–3 margin. Emory consequently took the remaining eight matches to move on to the UAA Championship final. Advancing to the UAA third-place match, the Maroons looked to wrap up their sun-filled weekend and finish strong against No. 9–ranked nationally and No. 2–seeded Carnegie Mellon University. Strong play from all the doubles pairings gave the South Siders a commanding 3–0 lead, only requiring two wins out of the six singles matches to claim victory. Second-year Ariana Iranpour efficiently clinched at No. 1 singles with a 6–0, 6–2 rout of her opponent. 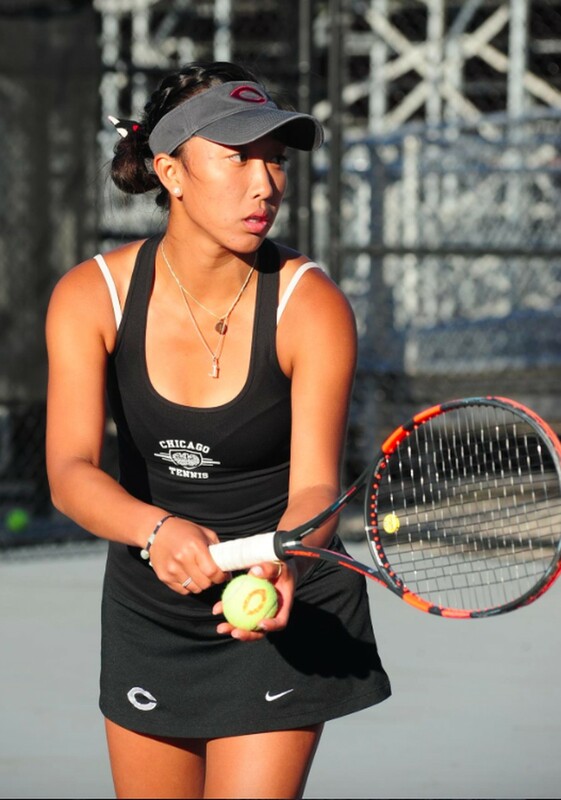 First-year Rachel Kim provided the match-winner minutes later, sealing a 6–3, 6–1 win at the No. 2 spot. Chen added another win at No. 5 singles to put the icing on the cake. Earning a third-place finish among a field of highly ranked opponents has surely placed the Maroons on the radar of the NCAA tournament selection committee. The Maroons await their fate until early May, when the NCAA tournament committee will announce the bracket. Should they be selected, the Maroons will play the weekend of May 13–15.